A handful of years ago, I crossed paths with Salomon Team trail runner Rickey Gates. We have a number of outdoors friends in common. It was the night before the Mount Washington footrace—which Rickey subsequently won– and I had just started getting addicted to trail running in Switzerland. Rickey had a number of European trail racing seasons behind him, and I eagerly soaked him for info about various events. Verbier-St. Bernard. Glacier 3000. 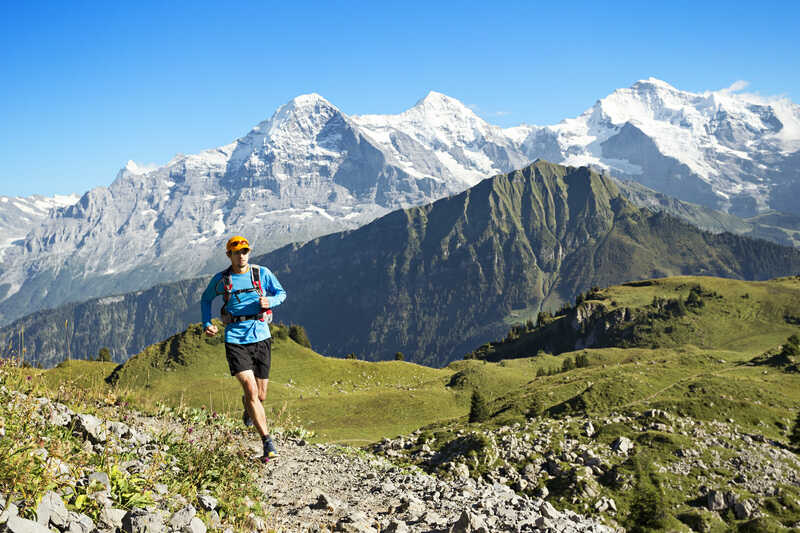 Jungfrau Marathon. The list is practically endless. Rickey made a point of mentioning Sierre-Zinal, a race that had alluded my US-based trail running radar. “You really should do Sierre-Zinal,” he said. There was something in his tone of voice. I filed the thought away. Two years ago, I had my chance. I was blown away. I felt like an explorer who was looking for a lost valley, and stumbled across an entire continent. What happens when your reality is bigger than your dreams? In my case, I couldn’t stop talking about it. This year, I got a chance to come back. And mind you, I have a reputation for being hyper-enthusiastic about things. I wondered, how would reality stack up against 24 months of memories. It was better. Really, it was. Marc Lauenstein, a dentist from nearby Neuchâtel, surprised the field and won Sierre-Zinal this year. On the front page of every newspaper in the country, he shouldn’t have any problems filling up his practice. *The course. For my running background, 31km is ideal. I’m not out all day, but it’s long enough to require some pacing strategy, and food and hydration management. And what better way to structure a run than with the brutish 1,600 meter battle right off the bat, followed by a stunning, high-elevation cruise, then a “I’m-almost-outta-control-here-we-go” high-speed plummet to the valley? *The scenery. Race organizers call Sierre-Zinal “La Course des Cinq 4000”—the Race of the Five 4,000 meter peaks. Along the way, you’ll catch views of some of the most famous peaks in the world. The Weisshorn. The Zinalrothorn. Obel Gabelhorn. Dent Blanche. And, of course, the Matterhorn. But that’s only part of the picture. The rest? High alp pastures, historic mountain hotels, deep forests and—of course—no shortage of cows along the course. *The crowds. Everyone of us runners, no matter how introverted we are, gets at least a bit jazzed by a crowd-lined trail. And Sierre-Zinal has that just when need it. From the small village of Chandolin, to hikers perched on precipices above the course, onlooks are shouting “Hop! Hop!” and “Allez-Allez” to even the most sluggish of contestants. The result, for me, was a perma-grin for much of the route. Sierre-Zinal: Switzerland’s version of the Superbowl? Close, but not quite. Though the graphics are on par! *The history. This year was the 40th running of Sierre-Zinal. In a sport that seems to be just on the cusp of moving from quirky-niche to quasi-mainstream, 40 years is an eon. To mark the occasion, race organizers had a number of historical displays. In Sierre, one could walk through downtown, and stop at interpretive panels presenting storied moments in the race’s history. And there are no shortage of legendary tales, either. *The finish. Could there possibly be a better finish, than flying a few hundred meters downhill through a classic Swiss village that’s lined with cheering onlookers? Sorry, it just doesn’t get better than that. US runner Curtis Moore comes cruising into town. There are many other reasons, too. Fabulous organization. Great support. Towns on each end that are all-in for the race. And, those little scenes along the way, like mountain fiddlers and alphorn players en route. Or the first serious views back to the Rhône valley city of Sierre, when you realize all that hard work is paying off, and you’re well on your way into the sky. This year had an added bonus—a big one, too. Longtime mountain pal Curtis Moore, Run the Alp’s Val Stori and I had one of the most generous hosts going, in the Zinal presence of Rickey Gates, happily ensconced in town for the week. Chalet doors were thrown opened, invites to free meals appeared out of thin air. As race banners were hauled down and tucked away for another year, and as the sun fell behind the Zinalrothorn glacier at the end of the valley, wine started to flow from Sierre-Zinal race organizers to some of the world’s most elite trail runners– and three guests, who had been fortunate enough to take part in one of the greatest trail races going. During a break in the conversation, Rickey paused and said, “There are no other races in Europe this weekend. None. There’s only Sierre-Zinal.” I understood the sentiment immediately. Right at that time, if you were a trail runner, this was the place to be. Is Sierre-Zinal the best trail race in the world? “It’s all subjective,” I know my friends will counter. Well, maybe. Others will have different criteria. But, I’ve run my share of trail races at this point, from New England to California, Ireland to Switzerland. And for what I look for in a trail race, there’s none better. In fact, nothing is even close. Thank you for your great story. The run looks very, very hard. Are there any walkers ??? ?So if you could start three and a half hours earlier—what time would that be???? Again, THANK YOU. Tourists start at 5:30 in the morning! Some of them do the course at a fast hike/slow run pace, arriving perhaps 6 or 7 hours later. Race entry is closed for this year, already, as they met their 3500 limit! I’d encourage you to check it out some year. It’s a fabulous race! Heard about Sierre-Zinal from a Swiss running couple I met in Bozeman. Loved your article, and am thinking abut it for 2017….thanks.